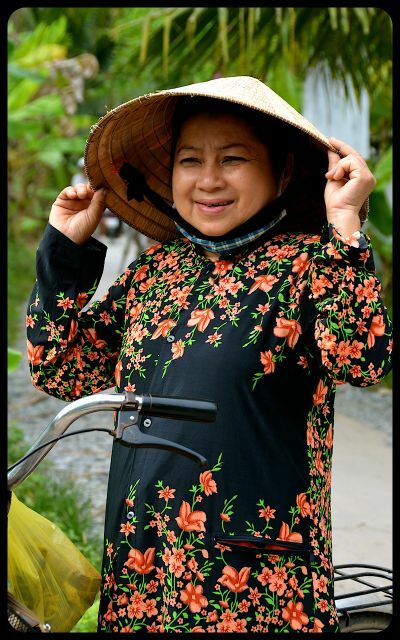 The conical hat is sported to protect the wearer from rain or sun – whether she be tending to a rice paddy, or selling fresh fruit on a bustling street. As an alternative, some Vietnamese ladies carry a parasol to protect their skin from the sun. The warm smiles of the people in Southeast Asia, and the vibrant landscapes and accents make photographing such a delightful pastime here! How did you like Vietnamese food, Trish? I love Vietnamese food very much and I just know that I would stop and try everything that I can get my hands on! Hi Karen! We loved the Vietnamese fare – especially that which we tried in the picturesque town of Hoi An. We did a cooking class there and made fresh spring rolls (using rice paper), a savory pancake-like dish (also rolled in rice paper), a banana pancake dessert (so sinful, but quite rich and delicious) and a light jeweled rice. Outside of Hoi An, we enjoyed western-type fare too (sandwiches on wonderful crispy baguettes). The sweet treats were fun too – particularly these gummy, rice-based sugary bars with sesame seeds inside. So tasty – my tummy is rumbling just thinking about it! I’ll be doing a post on the cooking class soon, with the recipes – so stay posted! Have you been to Vietnam?